As previously presented in the foregoing blog posts, KISC uses Integrated Pest Management and a combination of methods to control our targeted plant pest species. I disclosed the process in which we use to choose a particular control method, and also have given insight into some of our operations where we use manual and mechanical control. I have also mentioned that we sometimes use a combination of techniques, where we merge either manual or mechanical control with chemical control. There are various ways we apply herbicides to the invasive species we target, but we always have human and environmental safety first at hand. It is important to note that all the herbicides KISC uses are non-restricted, meaning they are no different than the weed killers that anyone can purchase to use in their own back yards. KISC field crew members have been properly trained to use chemical control in a safe and effective way. The newest form of chemical control treatment we use is called Herbicide Ballistic Technology (HBT). This method was developed by UH Assistant Weed Specialist, Dr. James Leary. 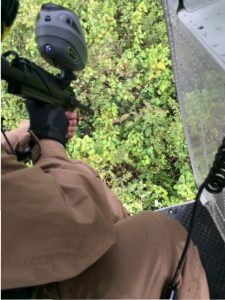 Dr. Leary works at the College of Tropical Agriculture and Human Resource center on Maui and has found a way to treat specific invasive plants with paintball guns. 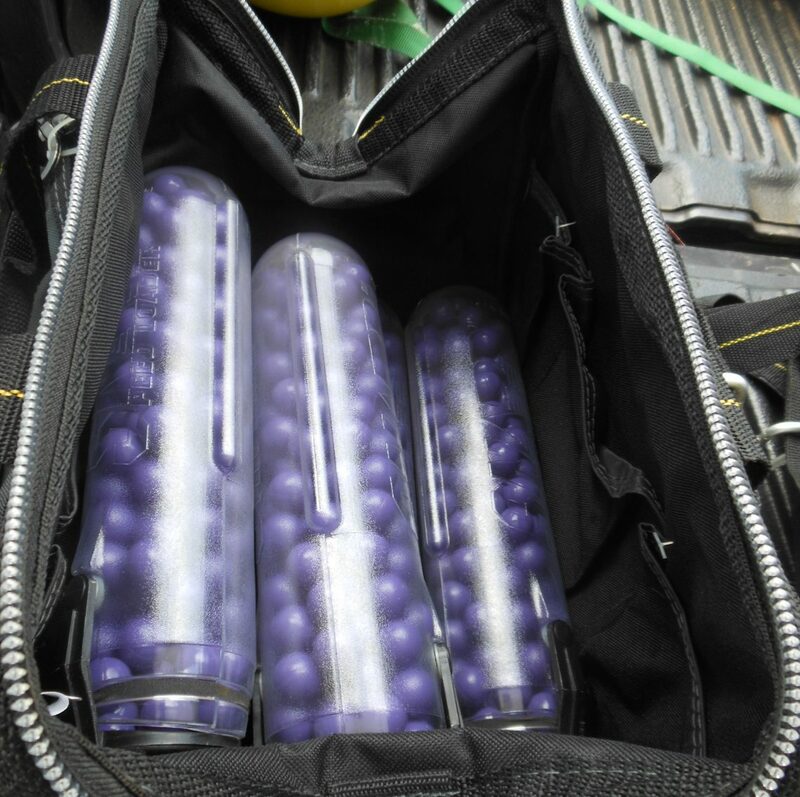 Yes….paintball guns. There are a few organizations in Hawaii utilizing HBT, and each weed that is targeted, Dr. Leary has specially formulated a specific herbicide treatment, in order to successfully kill each targeted plant. KISC uses this method for treating Miconia. I mentioned Miconia in the previous two blog posts, and how we use manual control on the ground to treat this pest. As Miconia is KISC’s #1 target, and it takes grueling man hours to hike the dense forest floors for new plants, we are always looking for ways to make our Miconia operations more efficient. HBT has done that for us. Here’s how this works. 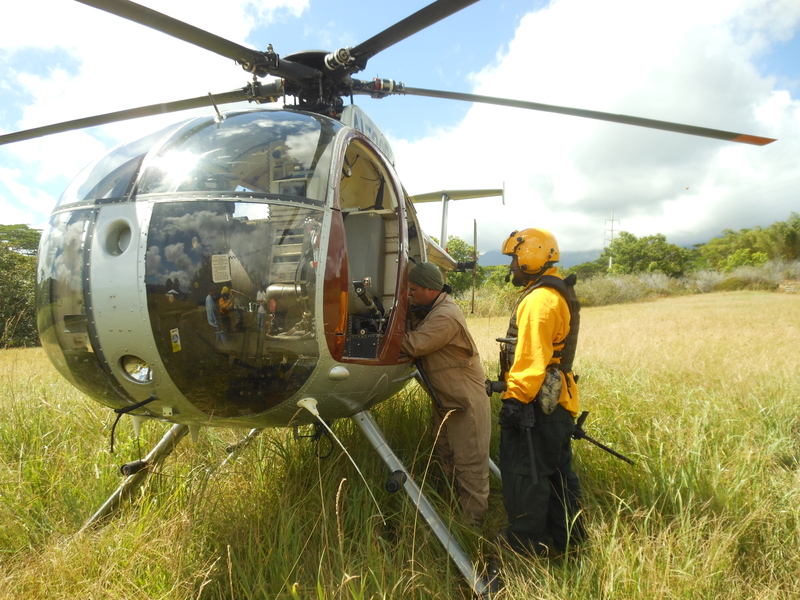 Once every three months KISC contracts a local helicopter company, where they send an Office of Aviation Services (OAS) certified pilot who is highly trained in utility and forestry work. Two KISC crew members and Dr. Leary join the pilot, and fly at a low elevation through the known Miconia infested areas. One crew member is taking GPS points, and one is surveying the land below them. As soon as a Miconia tree is sighted, the pilot stops, hovers in the air, and Dr. Leary unloads 5-10 paintballs on the tree, precisely shooting the tree at just the right kill spot, minimizing any over splatter. HBT can treat a Miconia tree with in a 30 meter rage. KISC has been using this method since 2011 and we have successfully treated 2 mature trees, and 86 seedlings. The bird’s eye perspective allows us to see plants that we may not have otherwise been able to get to on foot due to steep terrain and vegetation. The efficiency of HBT has reduced the weekly Miconia ground and manual control to bi-monthly surveys. KISC is now able to use that freed time to focus on other targeted species. 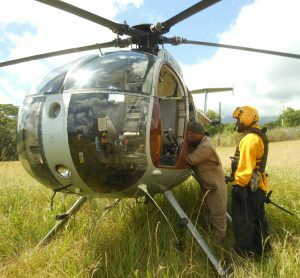 There are a few other herbicide treatments KISC uses, which are far less exciting than shooting weeds with a paintball gun from a helicopter. But, for the sake of accountability, I will share them with you. One of the methods use is called, the cut -stump treatment, where we manually or mechanically cut a deep-rooted plant down to a small stump and use a precision applicator bottle to treat only the stump area of the plant that was cut. We need to use this method for certain plants that are too large to remove the stump of the plant from the ground, or on particularly nasty invasives that easily re-sprout from even the smallest piece of root fragment left in the ground. Vines can be especially invasive to forested areas as they can climb, sprawl, smother, strangle, and grab onto anything in their paths. The herbicide treatment we use on most of our targeted vines is called Basal-Bark, where crew members will use a precision applicator to apply a contiguous thin line and low rate of herbicide on the base of the bark of a plant. When using any of these methods of chemical control, there are always specific environmental protocols we follow. We only use exactly enough herbicide to treat the targeted area on a particular plant, effectively allowing no run off from a treated stump, base of a plant, or over splatter from a paintball. We also do not use herbicides when an area has had or is predicted to have heavy rains, or if there is a slope where any fractional amount of accidental over treatment of herbicide could be harmful to an adjacent natural area. KISC has made some serious headway into eradication of some of our targeted species due to the effective safe, and efficient use of herbicides. The more efficient of a technique we can use, the sooner we can eliminate an invasive species off our targeted list, as well as off the island.